Where the coffee is always hot, and you're only a stranger once! Chuck Derby, a descendant of the Derby family was a lifelong quarrier and Pipemaker. The Derby family is one of only three traditional families that have been quarrying Pipestone for generations in Minnesota. Chuck first began learning his craft by his father's side at the age of five. As an adult, he continued to quarry, craft traditional Pipes, and made it his life's work to see the traditions and history of the Cannupa passed on to the next generation. Many of the Pipes carried in ceremony today have come through Chuck, or one of his family member's hands. The impact Chuck had on the Native American community, on Pipe Carriers, Sun Dancers and quarriers is great. Through his advocacy and education initiatives, many new quarriers were trained. Because of his skills as a quarrier and a Pipe carver, many people have become able to carry a sacred Cannupa. Chuck opened the Little Feather Indian Center in 1986 in response to the devastating effect of cultural destruction that Chuck witnessed and to the death of his brother. The younger generations were turning away from the old ways, languages and traditions of the Pipe. Instead, they turned to alcohol and popular culture. As each generation passed away, more and more of the traditions were lost. The Little Feather Center opened to pass these traditions forward to the next generation. 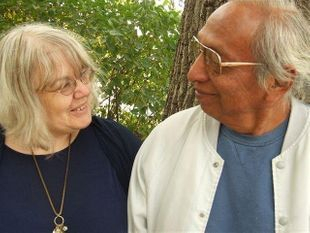 Chuck and Gloria did this through lectures, displays and through the cultural education program, "Beads and Buckskins." In 2010, Chuck was diagnosed with pancreatic cancer. Chuck was concerned about what would happen with his Center and the educational outreach he had devoted his life to. He worried about who would be willing to make the sacrifices necessary to see his vision passed forward into the future. Michael McGee, our Curator of Interpretation, sat down with Chuck before it was publically known that he was dying. Michael pledged that he would never let Chuck's vision die with him, that instead, it would continue on into the future. With this as his charge, Michael made plans to open the One Heart One Mind Interpretive Center. Chuck and his wife Gloria encouraged Michael in this and were happy to see this happen. Today Gloria Derby sits on our Board of Directors to continue this support and the fulfillment of Chuck's vision. All material is copyrighted and may not be used or reproduced without permission.